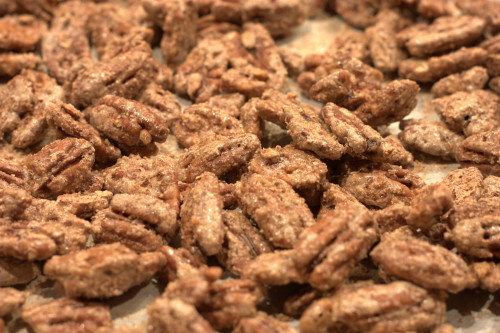 Ever since I can remember my family has been making these spiced pecans for Christmas. 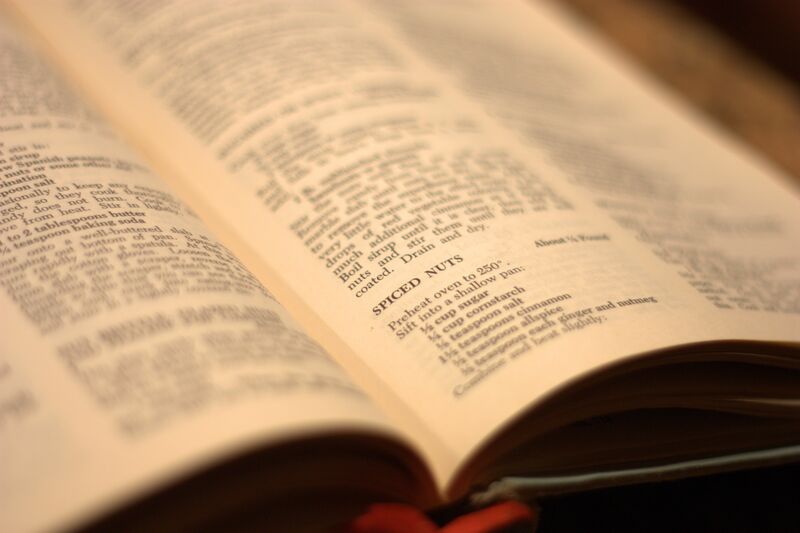 The recipe is a slight adaptation of the one found in the Joy of Cooking cookbook. The most notable change is that we have always made it with four-times the amount of nuts as compared to the original recipe. I have also added cloves and tweaked the ginger and nutmeg quantities since a 1/3 teaspoon measuring spoon isn’t common. Oh, and we have simplified the prep – instead of dropping the nuts one-by-one into the sugar mixture, we have found the dump-and-coat method to work just fine. The hardest part is waiting for the sugar coating to dry in the oven. 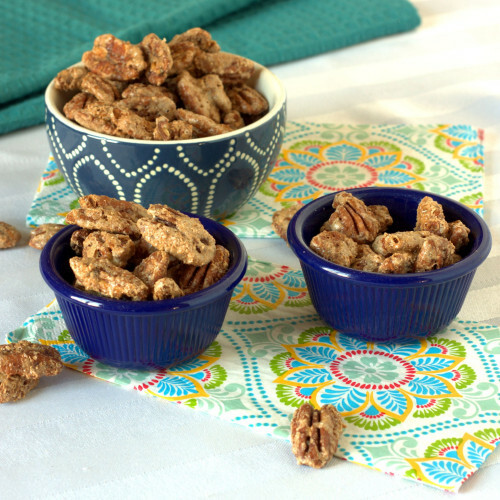 The nuts are baked at a low temperature to dry out the egg whites, to create the crunchy & spicy coating. One bonus of this baking process is that your house will be perfumed with the smells of the holidays, more so than any candle could provide. These spiced pecans last for quite a while, making them a good early baking item. They are also versatile too – they can be served as a dessert, sprinkled on a salad, or poured into a pretty container and given as a gift. Alternatively, you can eat them just-because any time of the day, like my family. It’s a great way to build your holiday spirit! Preheat oven to 250 °F. In a medium sized bowl, mix together the sugar, cornstarch, cinnamon, allspice, ginger, cloves, nutmeg, and salt. 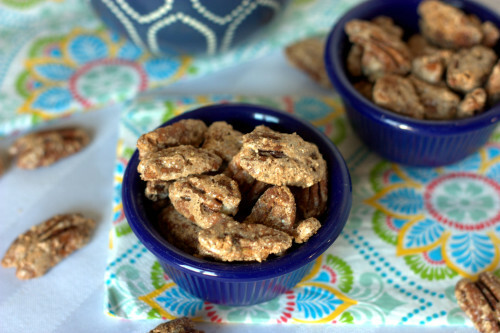 In a separate large bowl, mix together the egg white and water, then add the pecans and stir to coat. Once the pecans have been coated with the egg whites, sprinkle on the sugar mixture and stir until the pecans are evenly coated. 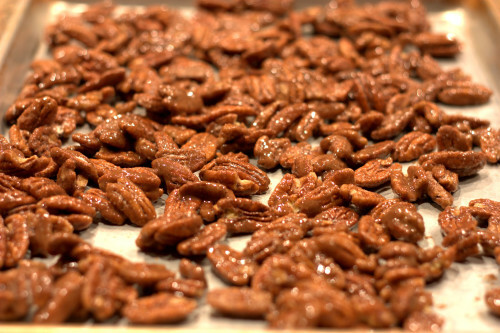 Spread the pecans onto a large baking sheet and bake for ~1 hour, stirring twice, or until dry. Cool and store in a tightly covered container. This entry was posted in Appetizer, Dessert and tagged nuts.